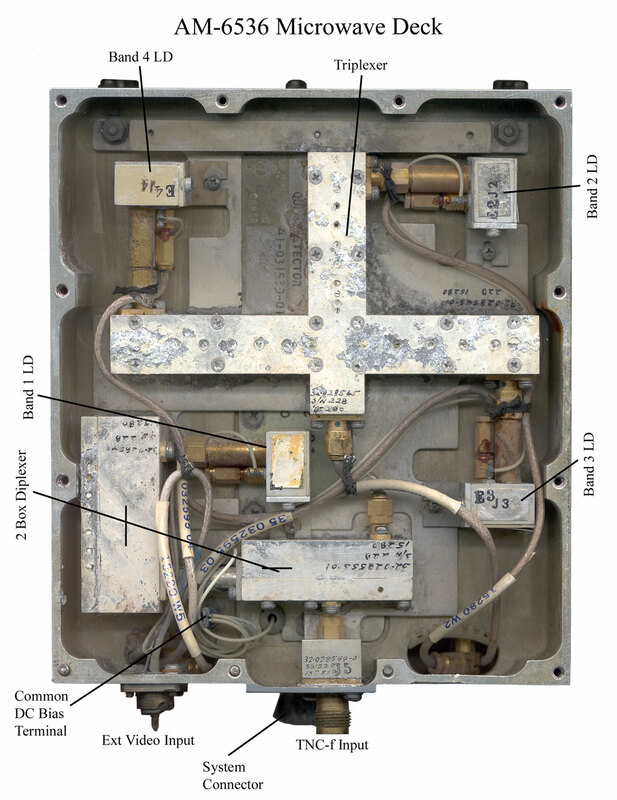 Microwave Face with major parts labeled. be a Wilkinson power divider (Wiki). I recently found this RWR box on eBay and could recognize the Limiter Detectors as those that I designed. I did not know they were used in the first generation LAMPS I (Wiki: Light Airborne Multipurpose System, SH-2 SeaSprite). This particular unit has seen some extreme abuse that might include salt atmosphere for 30 years with one cover removed and in addition to physically breaking the connectors. It's interesting that the gold plated parts of the limiter detectors look as good as the day they were made. The filters that may be made with silver plating on aluminum are pretty grungy. The early RWRs were what's called "crystal video" types. Essentially they are crystal radios. That's to say the antenna feeds a frequency selection network which feeds a crystal detector. After the detector is a video amplifier (usually it's a logging video amp) and on to the processing circuitry. There is no local oscillator, no mixer, no IF amp. This makes for a lower cost receiver although one that's not as sensitive. 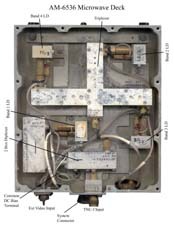 For microwave RWRs the frequency selection network consists of a multiplexer (in the case of the ALR-54 it has 4 outputs) that typically had 3 or 4 outputs each driving a Limiter-Detector (LD) followed by a video amp. An airplane would have 4 of these boxes, one for the nose antenna, one for each of the two wing tip antennas and one for the tail antenna. So one plane might use 12 or 16 LDs. I'm not sure how many antennas are on the LAMPS helicopter. If you have a Jane's book with first generation LAMPS info I'd like to get a copy of the page. For more see my RWR web page, Aertech web page. At Aertech I developed the combined microwave Limiter Detector. The model numbers are A9X141, A9X142, A9X143 and A9X144. The A9X models were all special limiter detectors. And 141, etc. numbers were from a sequential book of special numbers Catalog parts had a frequency band code as part of the model number but on specials you can not tell anything about specs from the model number. In order to get microwave frequency operation packaged diodes could not be used because of the package parasitic inductance. Instead a ribbon or mesh of gold was bonded from the input pin to the first diode, to the second diode and finally to the output of the limiter (which in a limiter detector was the input to the detector). The spacing of the diodes and the width of the mesh was designed to form a low pass circuit that would pass the highest microwave frequency. These could be tuned by hand using a stereo zoom microscope and a pin vise holding a sewing needle by moving the mesh up or down and adding a drop of black insulating epoxy to act and a dielectric forming a capacitor. This was done using the HP 8410 Vector Network Analyzer with a Smith Chart display plug-in. The LDs use Schottky diode detectors which need to be DC biased. Part of the microwave tuning of the LD is to determine the optimum bias current for that particular serial number unit. Too much bias and the output is too low and the VSWR is too good. Not enough bias and the output is high and the VSWR is too high. The bias current is set by a resistor in the box on the end of the LD that also contains the output connector and a solder terminal for the bias voltage. The AM-6536 has a common terminal used to feed all the LDs the system bias voltage. 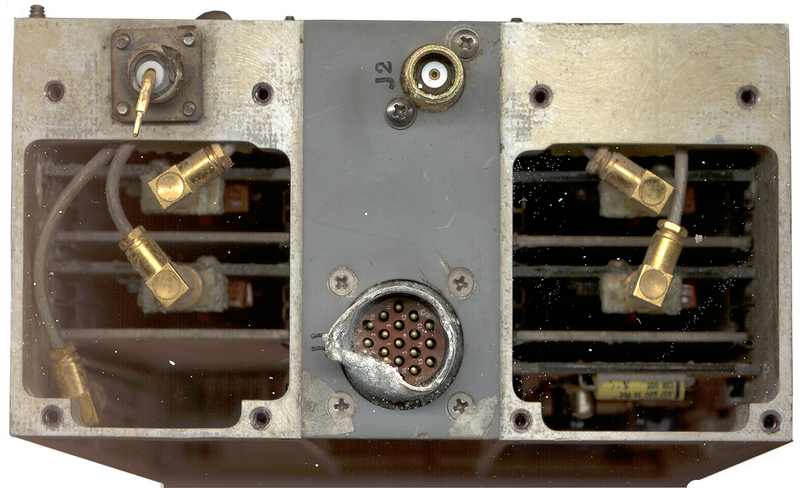 Input diplexer that passes the desired microwave frequency band and looks like a short for the video output frequency band. Input matching circuit. These LDs use a single diode and one or two quarter wave transmission lines for impedance matching. The diode can be either shunt or series mounted depending on the design and output polarity, but I think these were shunt mount. Output diplexer that passes the video bandwidth and looks like a short for the input frequency band. The log video amplifier was made by Itek using all discrete components. I think it's a log amp rather than a linear amp and that explains why 13 transistors are used, which would seem like too many for a linear type amplifier. 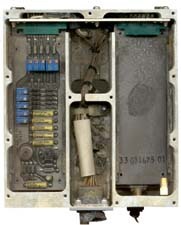 The input is an SMB coax connection and the DC power supply input and output are on the 5 card edge connections. This amplifier has been highly optimized in terms of video bandwidth and noise as well as logging range. To measure the Noise Figure of the log video see the Microwave Test Equipment web page. This board which is the same mechanical size ( 2.0" x 5.3" O.A.) as the video amplifier boards takes in the five signals and probably has gain and offset adjustments for each channel. Then all 5 signals are fed to the central signal processor box. Is the multipin male circular military connector that has the DC inputs and the 5 channel video outputs. It's been smashed so badly that the contacts can not be counted so more on this later. Maybe 19 male pins marked 1 to 19. Is the TNC-f microwave input connector that's fed typically from a cavity backed spiral wide band ECM antenna. These typically have a flat face a few inches in diameter, but some have a conical shape. Don't know for the ALR-54 which were used. AN/ALQ to AN/ALT - Equipment Listing - be sure to scroll all the way to the "R" not the "Q". page created 30 Jun 2006.